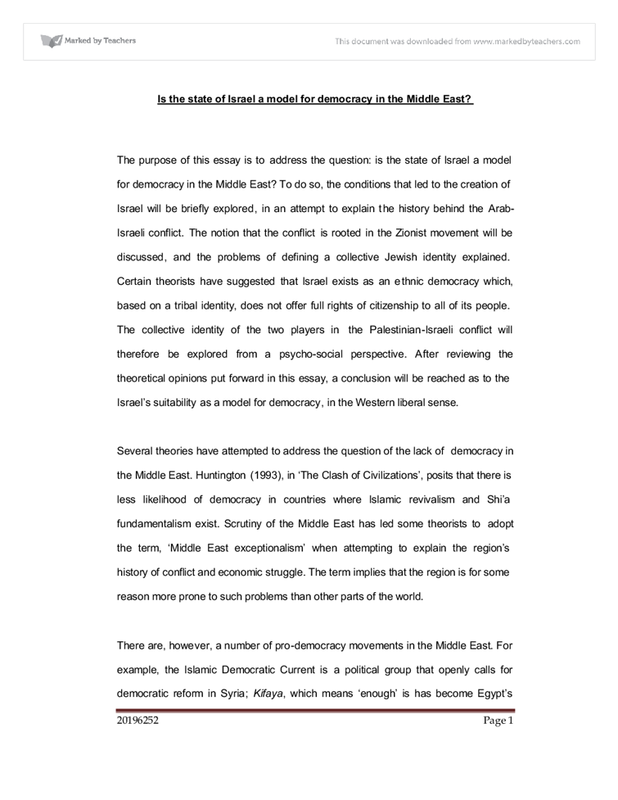 The purpose of this essay is to address the question: is the state of Israel a model for democracy in the Middle East? To do so, the conditions that led to the creation of Israel will be briefly explored, in an attempt to explain the history behind the Arab-Israeli conflict. The notion that the conflict is rooted in the Zionist movement will be discussed, and the problems of defining a collective Jewish identity explained. Certain theorists have suggested that Israel exists as an ethnic democracy which, based on a tribal identity, does not offer full rights of citizenship to all of its people. The collective identity of the two players in the Palestinian-Israeli conflict will therefore be explored from a psycho-social perspective. After reviewing the theoretical opinions put forward in this essay, a conclusion will be reached as to the Israel’s suitability as a model for democracy, in the Western liberal sense. Several theories have attempted to address the question of the lack of democracy in the Middle East. Huntington (1993), in ‘The Clash of Civilizations’, posits that there is less likelihood of democracy in countries where Islamic revivalism and Shi’a fundamentalism exist. Scrutiny of the Middle East has led some theorists to adopt the term, ‘Middle East exceptionalism’ when attempting to explain the region’s history of conflict and economic struggle. The term implies that the region is for some reason more prone to such problems than other parts of the world. There are, however, a number of pro-democracy movements in the Middle East. For example, the Islamic Democratic Current is a political group that openly calls for democratic reform in Syria; Kifaya, which means ‘enough’ is has become Egypt’s main pro-democracy group and spearheads demonstrations against the government; Iran’s Green Movement has recently mobilised over three million people protesting against the re-election of President Ahmadinejad and called upon the American President Obama to side with them against the regime (Allen, 2009). Sorli et al (2005), comparing the Middle East with other regions find it to be characterised by ‘authoritarian regimes, oil-dependent economies, Islam and the protracted Israeli-Palestinian conflict’, (p.142). Fawcett (2005), places the Arab-Israeli conflict within the broader historical arena of colonialism and post-war international relations: after the fall of the Ottoman Empire, the Arab countries aspired to national independence. However, the Arab states, divided as they were by factionalism and in-fighting, were new to European diplomacy and faced problems negotiating with Europeans still influenced by imperialist interests in the region (pp.18-19). Arab-Israeli hostilities are rooted in the Zionist movement and first began to emerge in the late nineteenth century, as Zionist ideology developed with the increased immigration of European Jews. Many of the Jews settled in Palestine and Israel, which were at that time still part of the Ottoman Empire. The Ottomans had managed to maintain a degree of stability in the Middle East and at that time Arabs, Jews and other minority groups lived in peaceful co-existence. After the fall of the Ottoman Empire, the region was divided and in 1917 the British government issued the Balfour Declaration, confirming ‘the establishment in Palestine of a national home for the Jewish people.’The declaration, which caused great disquiet in the Arab world, was a result of the belief of key members of the British government, that Jewish support was vital to victory in World War One (Segev, 2001). After the war, the area that today includes Israel, Jordan, the west Bank and Gaza, came under British rule as the British Mandate of Palestine. Israel became a state in 1948, with David Ben-Gurion as its first president. According to Freedom House, Israel is a free electoral democracy where all citizens can vote from the age of eighteen. The three main parties are right-wing Likud, centre Kadima, and centre-left Labor. Parties or candidates that deny the existence of Israel as a Jewish state, oppose the democratic system, or incite racism are prohibited. Presidents are elected by the one hundred and twenty-seat Knesset for terms of seven years. Twelve members of the current Knesset are Arab-Israelis (www.freedomhouse.org). Smooha (2002) suggests that, while many Western countries are moving away from the notion of the nation state, and towards a multicultural democracy, there are others that are consolidating an alternative democratic state that identifies itself as a single ethnic nation. Smooha (2002) applies this model of ‘ethnic democracy’ to Israel, positing that, ‘Contrary to its self-image and international reputation as a Western liberal democracy, Israel is an ethnic democracy in which the Jews appropriate the state and make it a tool for advancing their national security, demography, public space, culture and interests.’ (p. 475). In order to unpack this notion of ethnic democracy, it is necessary to explore the reasons behind Jewish immigration and the way in which it links to the Jewish identity and the secular ideology of Zionism. What then is the Jewish identity? Until recently the three main principles of being a Jew were commitment to: Am Yisrael (the People of Israel); Elohei Yisrael and Torat Yisrael (the God of Israel and God’s Teaching); and, Eretz Yisrael (the Land of Israel). According to the principle of Eretz Yisrael, any other place that Jews live in the world is exile from the original and Promised Land of the Jew (Ben-Rafael, 1989). ‘...to investigate the extent to which, nearly two centuries after the emancipation, and in the aftermath of the Holocaust and the creation of the state of Israel, one may receive consistent answers to the question of who is a Jew.’ (p. 35). The results of the study revealed that the notion of Jewry is grounded in religious faith and national identity. There was a general consensus among the respondents that Judaism does not distinguish between religion and nation. Being a Jew comes before all else, therefore, for example, a person cannot be a Jewish Englishman; rather, he would be identified as an English Jew. Thus, there is no notion of Jewish identity independent of religious identity. The balance between religion and nation, however, appears to vary depending on the society in which Jews live. Elazar (1999) noted that Jews living in Israel consider themselves to be a ‘nation’; in America, a ‘religion; and, in other parts of the world, an ‘ethnic group’. Not all Jewish people are Zionists; there are many liberal Jews, both in Israel and the rest of the world who do not support the conquest and subsequent occupation and colonisation of the West Bank and the Gaza Strip, and who dislike the equation of Zionism with Israeli expansionism. However, anti-Zionism is as difficult a term to define as Zionism itself, as it depends on which view of Zionism it is opposed to (Brown, 2001). ‘Through these measures, Israel has denied the indigenous population the right to self-determination and indicated clear intention to assume sovereignty over portions of its land and natural resources. Permanent annexation of territory in this fashion is the hallmark of colonialism.’, and concludes that ‘Israel's policy is demonstrably to fragment the West Bank and annex part of it permanently to Israel, which is the hallmark of colonialism.’ (Tilley, 2009). For Gorny (1987), Zionism is an ideological construct that developed out of Romantic German nationalism, which defines state as a composition of people sharing a common ethnic heritage. Similarly, Beit-Hallahm (1998) posits that the creation of Israel by the Zionist movement ‘is a deliberate attempt to create a secular nationalism and a secular identity out of a collective history that is totally marked by religion.’(p.191). In Zionist discourse, the state of Israel solves the problem of identity for Jews all over the world. Prior to Zionism the cultural identity of the Middle East was a blend of Arabs, Israelis and Jews. It can be argued that Zionism disjointed this, with devastating effect upon the Palestinian people. According to Kimmerling (2003), the continued occupation of Palestinian territories moves Israel closer to a Herrenvolk democracy, where one group of people has full rights of citizenship, while another group has none, as was the case in the apartheid regime of South Africa (p.39). Kimmerling (2003) posits that the Israeli ethnocentric identity has fuelled politicide against the Palestinians, and contends that ethnic cleansing has become a legitimate subject of discussion among Israelis (p. 202). Kimmerling describes the ‘tribal’ orientation of the Israeli identity and maps out its origins in, amongst others, the subjugated Jewish immigrants from Islamic countries, the hard-line political right and the strong nationalists. A combined tribal identity creates an ‘us’ and ‘them’ division which motivates and sustains the conflict. Furthermore, America, in the ‘war against terrorism’, attributes the spread of Islamic radicalism to the persistence of authoritarianism in the Middle East; as a consequence, issues of socio-political reform and democracy in the region are at the top of Washington’s agenda (Zambelis, 2005, p.88). It may be argued that the anti-Islamic feeling of many in the West, along with the push for democracy, has meant that the full impact of Israel’s actions gets overlooked. It is useful, when considering any group of people, to take account of the psychology of the collective identity. Erikson (1959) took strong account of the significance of history and culture in the development of the individual, asserting that identity refers to ‘a conscious senseof individual identity’ as well as ‘a maintenance of an inner solidarity with a group’s ideals and identity’ (p.109). Erikson (1968) also placed emphasis on the relationship between ideology and identity, viewing ideology as ‘a system of ideas that provides a convincing world image’ (p.31). This notion of world image is useful in explaining the intractability of the two sides of the Palestinian-Israeli conflict, as each has constructed a narrative of identity that bears no resemblance to the others. For Jews, their history is one of persecution. Denied a home of their own, they feel justified in creating a homeland in the land of their origins, a democratic nation where they can confirm their Jewish identity and live in peace. The narrative of the Palestinian people, however, tells a different story. For them, the creation of the state of Israel was at the expense of the Palestinians. The Arab population of Palestine in effect has become a dispossessed and marginalised people, in the same way that the Jews should recognise from their own history. The Gaza Strip has become home to almost one and a half million Palestinian refugees, living in unacceptable conditions. In conclusion, defining Israel as a model for democracy in the Middle East becomes problematic. In the Western liberal sense, a democratic nation affords full rights to all its people. Features of a democracy include equal rights and civil liberties for all, overseen by a freely elected government. This ensures ‘majority rule’, a characteristic feature of democracy. All these features apply to Israel, and in this sense Israel does deserve the title. However, according to some of the theories and opinions explored in this essay, the same government that affords democratic rights to the Jewish people stands accused of colonialism, apartheid ideology and racism against the Palestinian people who have been displaced by the creation of the state of Israel. By applying the socio-psychological theories of collective identity to the Palestinian-Israeli conflict, it becomes apparent that both groups are firmly entrenched in narratives that are in binary opposition to each other. Each group feels fully justified in their own actions and each group sees the other as a threat to their own existential security. Judaism is a religion; Zionism is a secular phenomenon, a political ideology and certainly the enemy of the Palestinian Arabs; there is perhaps some justification that it is also viewed by many as the enemy of the Jews. Perhaps the so-far unheard voices of non-Zionist Jews are the key to peace in the region and an Israel that is truly a model for democracy in the Middle East. 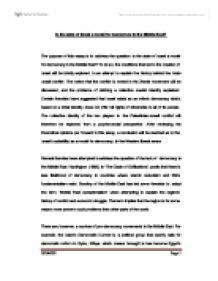 Zambelis, C. (2005) The Strategic Implications of Political Liberalization and Democratization in the Middle East, Parameters, Autumn 2005, pp. 87-102.
of 'imitation' and it is merely inspired by the customs in question. Indeed, in support of Durkheim, the whole process of socialisation ensures that we conform to a large extent, otherwise we will become deviants, and thus it is not an imitation with intent - therefore, perhaps, not an imitation at all. Floor-to-ceiling windows surround it. Along with its high wooden cathedral ceilings, it gives the room a bright fresh and airy feeling. Aside from the "sign in" table there are just a few folding metal chairs scattered around the glossy hardwood floor. These chairs are usually utilized by the "young adults", when they give their talks. a reed in the wind, his or her sermons being virtually reviews of books championing the latest cultural fad. No claims to ultimacy issue from these pulpits. "12 The breakdown of community is another phenomenon of modern urban life which is both increasingly present in the global south and thus a factor in the future of liberal Protestantism. This point was made Jackson when he stated that 'Whereas other forms of communication have involved laborious investment in 'pushing out' information, a web site on the Internet with relatively low maintenance allows others 'pull in' the information they want'.' (Jackson, 1998, p.5) This saves valuable time, effort and cost. Parmi les grands ph�nom�nes d�mographiques, l'immigration internationale est le seul qui donne les pleins pouvoirs au gouvernement. C'est l'�tat qui s�lectionne les candidats qu'il accepte de voir entrer dans son pays. La motivation �conomique est r�ciproque aux deux acteurs mis en cause. However, cultural diversity with a desire for equality, works to breakdown the claims to authoritative knowledge. It became paradoxical that a religion could hereafter present the idea that God rules our private life but not the lives of others in a public place (Bruce, 2002).